The period of the board track racing is the late teens to mid to late 1920’s. The "Wrecking Crew's" front racer is an eight valve factory racing motor, and as recorded, somewhere around twelve were made or found. The second racer in Harley’s IOE (intake over exhaust). These were standard production motors. All of the motors had a lost oil system. The oil passed through the motor then went out on the chains and then was lost onto the track. The motors were mounted in reworked bicycle frames and were capable of 90+ miles per hour. There wasn’t any transmission or clutch, only direct drive. They were pulled to start and only had a kill button and compression release which was used, should they want to slow down. Oil was kept in one side of the gas tank (Harley) or separate tanks (others) with a hand pump to keep the pressure up. The race track, an approximate ¼ to ½ mile, was made of wood 2 x 4’s laid on edge to create a banked oval. Between the weather and the oil being dumped, the tracks were nearly impossible to maintain and many riders were injured from splinters and even some deaths resulted. Consequently this type of racing lasted only a few years (the late teens to mid or late 20’s). Hence the name, splinter board or board track racing. The riders were usually small and slender and wore leather pants with leggings over high-top lace up shoes or boots. The leggings would protect them from the chain and oil. They wore turtle neck sweatshirts, possibly with factory name on the front. There were a few helmets but mostly leather caps with ear covers and goggles. These sculptures would be a typical scene, possibly with different leaders, but Harley’s eight valve and the “Wrecking Crew” got their share of wins. Of course, the war was always on between Harley and Indian. 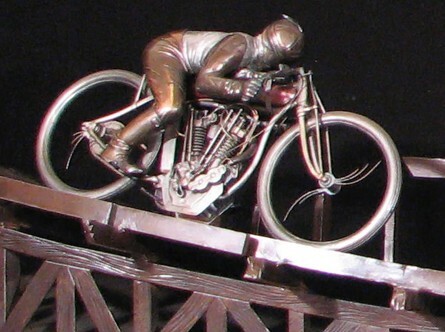 The walnut base, with turn tables on the single riders, is approximately one and one-half inches high making the sculpture nine and one-half inches at the highest point. The motorcycles are all hand fabricated from the smallest motor part to the wheels. The riders are hand built from hammered and welded steel, then detailed. These one-of-a-kind sculptures have no cast parts. The race track has simulated 2 x 4’s cut and shaped from plate steel. The creation time of the three sculptures from research to development was three years. These are the finest steel sculptured fine art you will find! 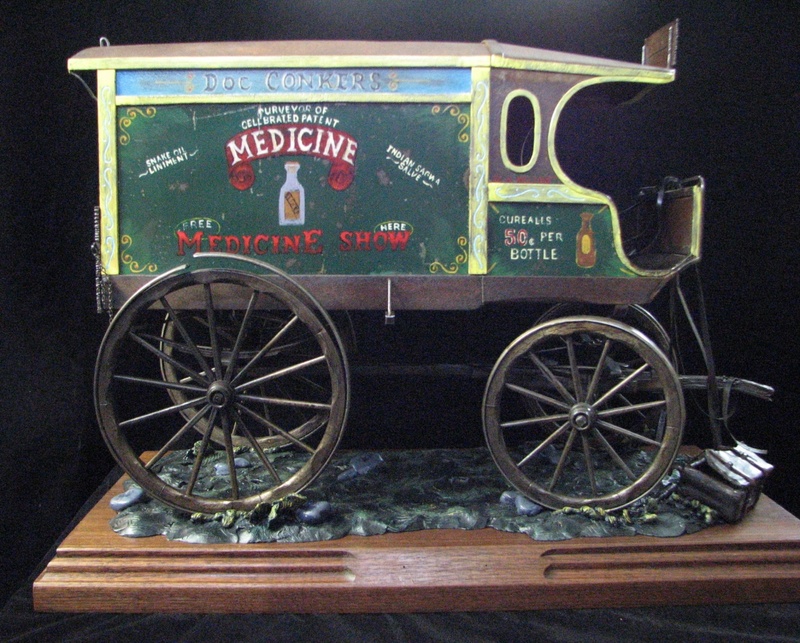 Throughout history there have been peddlers of medicine and medicine shows. Their wagons were either, self-made, blacksmith, woodworkers or delivery wagons, such as ice, butcher, or merchants, some nicer than others. Although they were looked upon as quacks and snake oil salesman, they were still the only source of entertainment in the small towns. Their medicines consisted of mostly bitters, alcohol, drugs, gasoline, Indian remedies and other trickeries. They were uncontrolled by government. Near the turn of the century restrictions were put on them. Some of the patents were only applied to the labels not the contents. They were known to sell alcohol in bars that were labeled as bitters, due to tax rules. As times changed and controls got stricter, they faded, but carried on with shell games and vaudeville with entertainers such as Bob Hope, Jack Benny, W.C.Fields, and others. The peddlers dwindled down to companies like “Hadakol”, “Bromo Seltzer”, to name a couple. When television came upon the scene, it pretty well took over the entertainment from the medicine shows and retired the peddlers of times-gone-by.